Skewb is my favourite event, so it makes sense to get a good one. The MoYu skewb is one of the best skewb right now. The speed of this skewb is very fast, it can perform 360s with one flick. I am able to do sledges around ~1.8 seconds, which was better than I could do with the shengshou, I haven't even lubricated this yet. Corner cutting is amazing for a skewb, I tried someones setup moyu skewb which could do almost a center of corner cutting. 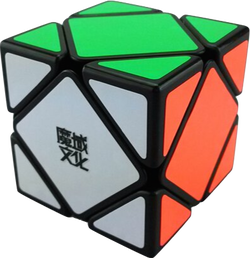 The MoYu skewb is the first skewb to implent florian cuts. I gave this a four for corner cutting, because it could be improved. When I do sledges and hedges, I seem to get a little bit of locking, I think think this category depends on your turning style, but I still dont get much locking, I gave this a four for locking. Corner twisting doesn't happen on skewbs, so I used this category to talk about the feel. Its smooth but clicky, I've heard people putting LanLan springs in this, which apparently removes the clicky feeling. It's still not as clicky as the shengshou, but the factory springs are pretty clicky. When turning fast this skewb is slightly bumpy. Popping is minimal, I've never gotten a pop, however the factory tensions are pretty loose. All in all, the moyu skewb is the second best skewb. It is now my main skewb since I have not bought the QiYi yet. This is a great and cheap skewb to get. Best skewb really nice clicking sound with the ball baring and I would recommend the anyone who likes skewb or is getting into it or as in my case your first skewb, this is the best no pops with the anti pop mech and no lockups and it can corner cut good I love all moyu cubes especially the skewb, over all its a 5 star rating. Best Skewb. The skewb has a dry smooth feel similar to other Moyu puzzles. The ball bearings create a click that feels nice and isn't to strong. Speed is great and so is corner cutting.